Western Landscape Services needed a web presence that would allow them to showcase their abilities, designs and finished projects. They also required a site with an image gallery that would not require a lot of time to maintain and keep current. They approached Kingston's web development team at KL Insight to help them achieve their goals. 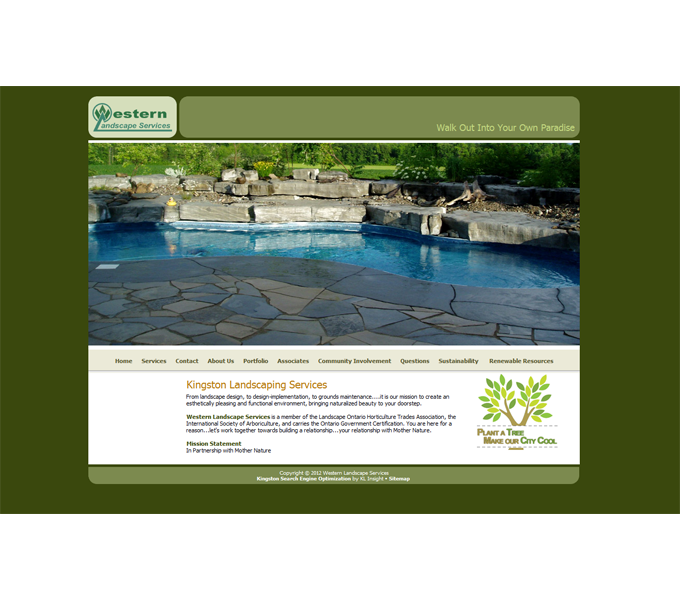 To develop a site that reflects and showcases the beauty of the work done by Western Landscape Services. By working with Western Landscape Services and understanding how they work, we were able to develop a web presence that reflects the beauty and elegance of the work created by them. By providing the tools to manage their portfolio, Western Landscape Services is able to maintain their portfolio with minimal effort thus allowing them to focus on their core business. They do not work for their website, it works for them. 993 Princess Street. Suite 200 Kingston, ON, K7L 1H3.